There are those products that come to market that get you all riled up as if you were a kid again and what you see on these pages is sure to get you going. As a kid, who didn’t want a sailboat that set off for unexplored lands while you played on the beach? And who didn’t want a plastic boat that braved the rapids of that stream behind your house? Well for big kids into boats, there is a new release that will blow away the wildest inner child’s imagination. 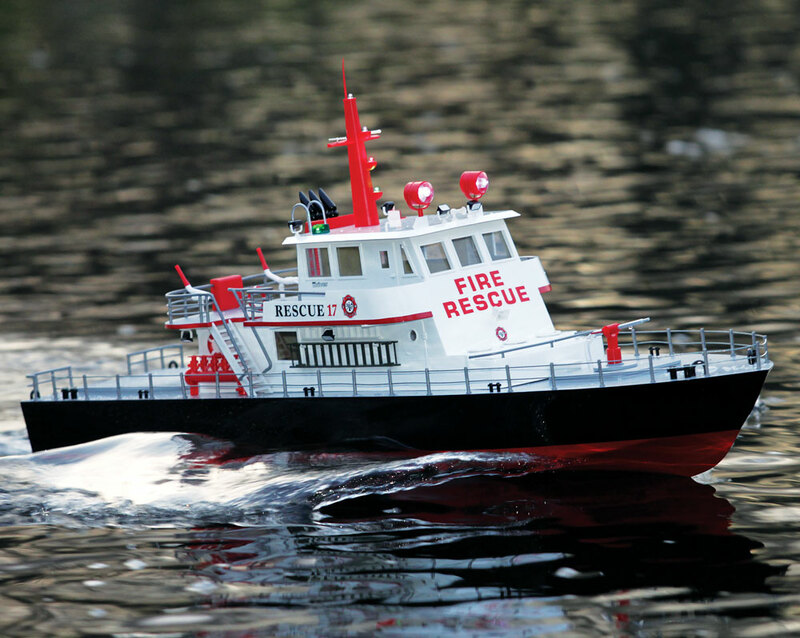 The new Aquacraft Rescue 17 Fireboat is the first model boat I’ve ever reviewed with an “interactive” feature, a rotating water cannon capable of shooting a stream of water 10 to 12 feet. It also has lights and a powerful brushless system to propel it to other boats in peril. This boat is sure to get that inner kid in you excited to brave the water as a scaled-down fireboat captain. DIMENSIONS: 1.4 x 2.2 in. The Rescue 17 arrived in a big shipping box. With an overall length of 38 inches, a large shipping box is required to protect the model. I was impressed by the packaging technique utilized to secure and protect the hull and cabin structure. There’s a considerable amount of packaging engineering required to create the foam padding encasing the hull to prevent damage during shipping. 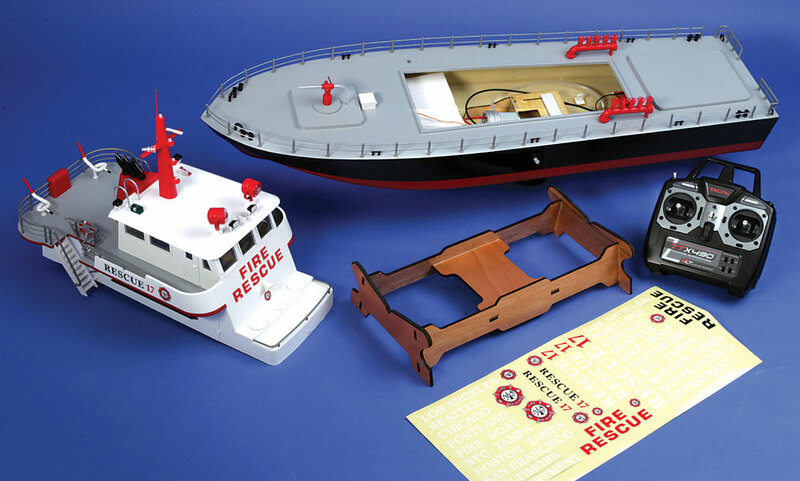 Although I had seen photos of the Rescue 17 on the inside cover of RC BOAT, Volume 4 and the AquaCraft website, I was still very impressed with the attention to scale detail on the hull and cabin structure. The Rescue 17’s amazing amount of detail adds to the realism. The old axiom, “A picture is worth a thousand words,” will provide a visual listing of the scale detailing. There only a couple of things that need to be done to the Rescue 17 to prepare for operation. The light mast is secured to the top of the cabin with the .15 x 16 screw provided. A dab of CA glue applied to the bottom peg of the antenna will hold it to the light mast. Two “AA” batteries, not provided, are installed in the battery holder inside the cabin to power the light mast. The plug between the battery pack and on/off switch needs connecting. The Tactic TTX 490 4-channel radio requires four “AA” batteries that are also not provided. Propulsion for the Rescue 17 is provided by an AquaCraft 600 brushed motor powered by a 2200 – 3300 mAh 3S LiPo battery pack. There’s plenty of space in the boat to use a 3S pack with a even a higher mAh rating. The AquaCraft Multi-Controller ESC provides both forward and reverse. Reverse speed is probably around 25 percent of top speed in forward. It is highly recommended that the pump be primed prior to using the water cannon. There is a direction sheet describing how to prime the pump. This procedure involves removing the water line from the intake tube to the pump, submerging the line in water, and then reattaching the water line. I primed the pump using a fuel bulb filled with water and connected to the intake tube. Squeeze the bulb till water shoots out of the water cannon and the pump is primed. A two-ounce Sullivan Brand fuel bulb is a common hobby shop item. It would also be possible to adapt a cooking baster bulb to shoot water into the pump. Before heading out to run the Rescue 17, I dropped by the local Walgreens to pick up some candles. 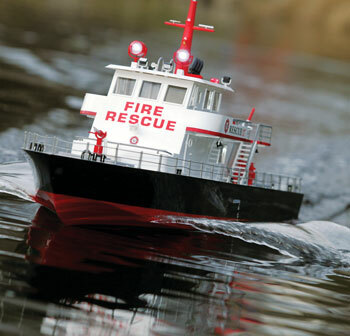 I have run nitro, gas, electric and sail boat model models over the past 50 years, but the Rescue 17 is the first time I’ve ever operated a model boat capable of extinguishing a fire. Granted, four candles on a piece of foam don’t provide a blazing fire. The candles did, however, provide sufficient flame to test my mini firefighting skills. I quickly discovered attempting to hit the candles with the water cannon wasn’t all that easy. Hitting the candles with the stream of water involved positioning the Rescue 17 the correct distance from the candles, using rudder and speed control and rotating the water cannon to spray across the candles. Racing a 60 mph hydroplane involves less coordination of transmitter inputs than attempting to keep the stream of water from the water cannon on the candles. The slightest amount of breeze greatly influences the positioning of the boat and the direction of the stream of water. At full throttle, the Rescue 17 moves across the water on plane with a great-looking bow wake. It is capable of making tight corners in either direction. 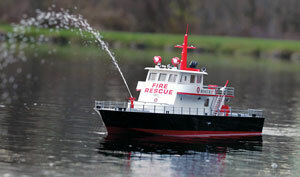 However, sweeping corners would be more in keeping with scale operation of a fire boat. Run time with a 2200 mAh 3S LiPo pack was 12 – 15 minutes, running at full speed. Longer run times would be available if the Rescue 17 was stationary or operated slowly while attempting to extinguish candles. A maintenance step not included in the instruction manual was greasing the driveshaft. After approximately one hour of running the Rescue 17, I removed the driveshaft and it needed to have grease applied. It is necessary to remove the rudder to allow removal of the prop shaft. A 1.5mm set screw wrench is required to loosen the set screws on the rudder control arm and shaft coupler. A thin coating of Grim Racer Speed Grease Drive Cable Lube was applied to both the driveshaft and rudder shaft. Wipe any excess grease from the end of the prop shaft to avoid splattering grease on the hull bottom. It was necessary to push the driveshaft slightly downward to insert the shaft back into the coupler. Make certain the flat area on the shaft matches the coupler set screw. After numerous trips to the lake with my Rescue 17, it seemed like there was something missing from the experience. That missing something was a siren. Having spent time at hobby shows with Ralph Warner, owner of RAM Radio Control Models, I knew Ralph had a siren in his electronics products inventory. Anytime I call Ralph, I know I’m in for a well-deserved, good natured ribbing. Over the years, Ralph has been very generous, providing me with various items his company sells for the RC aircraft, boat, and car enthusiast. Just a few days after our conversation the RAM Mark II Siren arrived in the mail. The siren kit consists of a circuit board, on/off micro switch, cardboard material for a speaker box, a 1.5-inch speaker, and directions with diagrams. The only assembly required is constructing the speaker box and gluing the speaker to the box. I painted the box black and attached Velcro to the top. Velcro was also applied to the top of the cabin in back of the middle window. The plastic window was removed to allow the sound to exit the cabin. The on/off micro switch is mounted to a separate servo with double back tape. A Y-harness plugged into the throttle section of the receiver actuates the servo when throttle is applied. I spliced a connector into the wires leading to the speaker which allowed the cabin to be removed without having to remove the speaker. The siren definitely adds realism when the Rescue 17 is in operation. The RAM Mark II Siren is available from RAM Radio Control Models, RamRCandRamTrack.com, or you can give Ralph a call at (847) 740-8726. 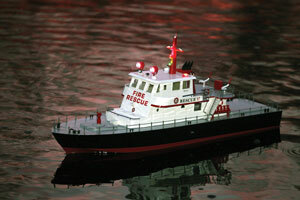 The Rescue 17 is a model boat an entire family could enjoy operating. My wife, Maren, ran the boat for the photo shoot. Maren’s attempt to extinguish the candles proved rather challenging. Steering the boat wide open around the lake proved much easier than dousing candles 10 feet off the bow. 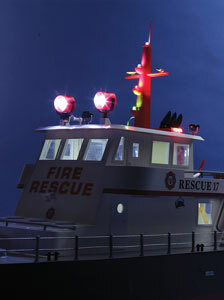 The Rescue 17 is visually impressive as a static and operational model fire boat and it can provide a feeling of accomplishment when the only thing moving is the water cannon spraying water on candles. 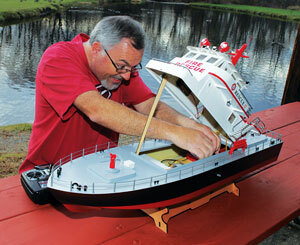 The Rescue 17 is proof you don’t have to be going fast to have fun with a model boat.